In the past, buying a car was pretty much a no-brainer. As long as you could afford it, you’d definitely get your own transport. But with ride-sharing becoming increasingly common, many Singaporeans are now choosing to completely forgo buying a car. Instead, these folks rely on a combination of public transport and Grab/GoJek to get around, and this serves them just fine. Don’t drive, and don’t intend to get a car any time soon? We’ve curated a list of 5 condos which are located exceptionally near to MRT stations (and hence ideal for you). Read on to find out more! Working in the North of Singapore? There might not be many condominiums in this area, but the options that are available to you are definitely more affordable than, say, condos in Central Singapore. Our top pick is this unit at North Park Residences, which is a 99 year leasehold development located on top of Northpoint City, the largest mall in Northern Singapore. With the MRT station located directly opposite you (and accessible via an underground tunnel), commuting will be a breeze. If you’re sick of the many eateries, cafes and restaurants in the mall, head to the food stalls at Yishun Central 1 (including the famous Yishun Laksa and 925 Chicken Rice). Don’t forget to check out the legendary nasi lemak at Chong Pang Food Centre as well. If you want to be located in the North-East, we recommend this unit at Watertown, which is a condo in Punggol. Now, Punggol has got plenty going for it already (including Waterway Point, Punggol Waterway Park, and the stretch of container bistros and pubs at Tebing Lane), but there’s even more in store for the nighbourhood. More specifically, Punggol Town Hub is slated to open in 2021; this will comprise of a new hawker centre, a library, and other amenities. As to why Watertown is a great place to live in? Like North Park Residences, this condo is an integrated development. 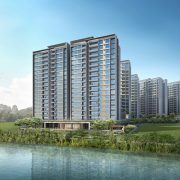 It’s located above Waterway Point and connected to Punggol MRT, which makes commuting via public transport a breeze. Plus, staying at Watertown puts you in easy access of the Waterway Park and the other amenities around Punggol. What’s not to love? Bedok may be an old-school neighbourhood, but it has plenty to offer. 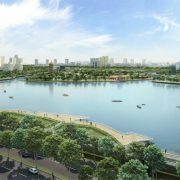 Highlight include Bedok Reservoir, where you can go kayaking, and Bedok Marketplace, which is a hipster hawker centre that features food stalls outfitted in traditional shophouse facades. 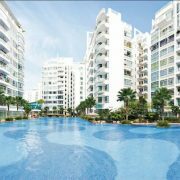 If you’re keen on staying in Bedok, we recommend this unit at Bedok Residences. The unit is located on a high floor and faces the pool, so we’re awarding extra brownie points for that. Also, the development is situated above Bedok Mall, which means it’s just a short stroll away from the MRT. All about that retail therapy? Go ahead and purchase this unit at J Gateway, which puts you in close proximity of Jurong East MRT Station and four malls: Jem, Westgate, IMM and JCube. The two bedroom apartment is located on a high floor and comes with an unblocked view, and with four malls located at your doorstep, you’ll be spoilt for choice when it comes to dining and shopping. Want to stay in town? 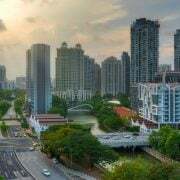 Your best bet is to look for an apartment that’s on the fringes of Central Singapore, as opposed to something that’s right smack in Central – the latter will definitely burn a hole in your wallet. A good option is this unit at Soleil @ Sinaran, which is a 99-year leasehold condominium that’s a three minute walk away from Novena MRT station. Novena Square, United Square, and various hospitals and medical centres are all a stone’s throw away. Is staying near an MRT station a priority for you? Voice your thoughts in our comments section or on our Facebook community page.